At present, it is not possible for animal protection groups, like ADI, to bring rescued monkeys into the US – despite the US importing huge numbers of laboratory monkeys! Tilin, the baboon we rescued in Bolivia, was not allowed into the US. ADI is supporting ‘H.R. 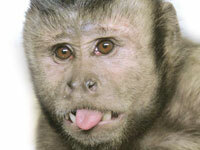 3556: Humane Care for Primates Act of 2013’ introduced by Congresswoman Renee Ellmers in November. If passed, animal rescuers will be permitted to bring primates to the US and provide them with sanctuary. ADI supporters in the US have been urging their Congress members to back the Bill.